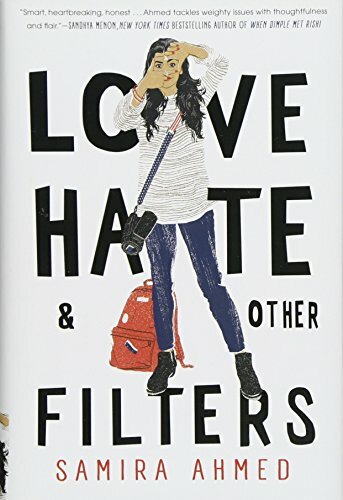 On a personal level, as a second generation Korean-American, I found Love, Hate & Other Filters to be a very relatable and realistic view of an immigrant family story. I can't speak to how accurately the author Samira Ahmed portrays Desi-Indian-Muslim-American culture, but I found a lot of Maya's struggles to be very similar to my own as someone who grew up straddling cultures. The United States is a country where individualism is considered a positive trait, where moxie is admired, where following your dreams is seen as an aspirational life goal, and where romance and marrying for love are the norm. These fly in the face of what is valued in a lot of other cultures—not that any one is right or wrong, but just to say that it's REALLY hard growing up in a country where the values run counter to the values in your home. It's a chasm that in some families cannot easily be bridged. But the reality is, that understanding is hard to come by from both sides. It sounds ridiculous to some people that Maya's parents make the decision that they do towards the end of the book, but I am telling you, I have experienced first-hand parents who made a similar decision for what I consider a far more ridiculous reason. I understand deeply what it feels like when your parents talk about their sacrifices so much that their payment of exorbitant private school tuition and rigid collegiate and career expectations feel like a stifling burden rather than a gift of opportunity. I have also experienced the romantic rules and expectations that put me in a position where I felt like I could never be honest about what I was feeling and who I wanted, not because I was a disrespectful brat, but because as a young adult, I didn't feel equipped to deal with the fallout. I've read a lot of other reviews of Love, Hate & other Filters on Goodreads and find myself fascinated by how polarizing this book is. As I said previously, I cannot speak as to the accuracy of the specific cultural and religious aspects of the book, but I WILL say that I find it very troublesome that a lot of the negative reviews seem to invalidate the author's own lived experience. The thing with stereotypes and implicit biases is that we all carry them about others and in some way about ourselves. ALL of us—you, me, everyone—whether we are willing to admit it or not. Numerous studies have shown this to be true. (Please don't comment about how I need to cite my sources; this isn't a research paper and you can google it yourself.) We can try not to let them affect how we see others and how we treat them and try to change but it takes a LOT of effort. Conscious micro-efforts, multiple times a day. In the meantime, we go through life being surprised or perhaps even angry that other people's lives don't line up with our own or with our own expectations of what we thought they would be. I've experienced this a lot in my own life from a lot of angles. I've been viewed as "not Korean enough" by other people in the Korean-American community because I don't speak or understand Korean and because I am not very connected to Korean culture. I've had non-Koreans tell me to my face that "they don't think of me as Asian" and thought it was a compliment. I've been grilled by white people about how my not speaking Korean must mean that I am ashamed of the culture. It's not uncommon for random people to pass judgement on me based on their own stereotyped expectations, especially in the very white, faux-liberal Portland, Oregon area. But I am just me, and while there are explanations for how I came to be the way I am, I don't owe anyone any explanations, nor is it ok for others to pass judgement because I'm not what they expected me to be. My life and experiences as a Korean-American are not invalid just because they don't line up with a stereotype. I think Love, Hate & Other Filters is important and valuable in this way, that it shows a side of Desi-Indian-Muslim-American culture that people, of and not of that culture, are not used to seeing portrayed and may not have realized existed because it doesn't line up with their own experiences or expectations. There are an infinite number of ways to be a "type" of person, and I'm assuming that's true of Desi-Indian-Muslim-Americans too. So I am glad for this book not just for what I related to, but for what I learned as well.